The Wordsmiths of Macon County met December 5,2013, at the Macon County Library and had a great time, from the sounds of this report from our Macon County Representative, Shirley Cole. "Sixteen guests and poets were present, and 12 to 15 pieces of original poems were read and discussed. We had four young guests, who heard Eugene Field's poem "The Duel' about the gingham dog and the calico cat. Everyone giggled and afterward the children approached me and thanked me for inviting them and sharing our gingerbread cookies with them. We may be on to something! Mrs. Moe, the head of the library, suggested to me that perhaps we would like to share our poetry with the children often. I agreed and am going to include a section of our next meeting for our children to bring us ''LOVE POEMS'' AND will send the Library small posters to display. OUR NEXT READING IS IN February and I am searching for funny poems to read to our children. I will encourage them to write some cursive if they so desire. The library received another donation from us as a thank you for allowing us to read. But, I think that they are very thrilled to have us." Thank you, Shirley, for this great report, and for all you are doing to increase literary awareness, especially for children, in Macon County. I've no doubt that the library is very appreciative. Shirley Cole the Representative for Macon County, NC is reaching out to the writers there. The Wordsmiths of Macon will meet on Thursday, May 2nd, 6 p.m. at 81 Great Oak Drive. A small supper will be served and the group is getting organized on a writing project. "We are looking to write poems about all the fruit stands in Macon County as our first writing project." Shirley encourages all those who write and live in Macon County to participate and take advantage of knowing and sharing with like minded people. Experienced writers can help beginning writers and that is what makes good writers even better. Working together helps everyone involved. Last fall the Great Smoky Mountains Bookfair sponsored a Poetry Contest for K-12 students in Macon, Haywood, Jackson, and Swain Counties. The winners were posted on my NC Laureate blog in November. Going through the rest of the poems submitted, I was struck by how many were just plain good, worthy of being enjoyed by readers of this blog. For the next two weeks I will be featuring one of these young poets daily. Each one will receive a small "thank you" from me. Please stop by everyday to read their work. This first poem is by Abrianna Berry, who lives in Franklin, NC, and is in the sixth grade at Macon Middle School. My dad hunted when he was little. Whipping up the holler, trees shaking. Me and Daddy went to the top of the mountain. Someone teaching in the 6th grade at Macon Middle School is doing a wonderful job encouraging students to write from their most cherished experiences. This young poet presents a moving and thoroughly believable scene; the wind whipping up the holler uses sound to make us feel the effects of the cold and the climb to the top of the mountain. The "silent talk" shows a depth and maturity beyond a sixth grader's years. Abrianna is already a poet, and I hope she continues to read poetry and to write it. Today I met Al Manning, NCWN Board Rep for Netwest, and Betty Cloer Wallace in Franklin to talk about Netwest and to discuss writing and writers in Macon County. After we left the Gazebo, I drove down to Mainstreet and wondered into Books Unlimited. There I talked with the former owner who was subbing for the present owner. 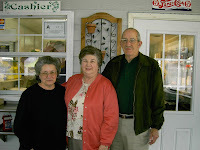 I'm sure the friendliness of these folks is one of the reasons that store has been successful for so many years. The wide array of books displayed in both rooms is the other reason. On the left, just inside the front door, I found a shelf filled with the books of local writers. The ladies said they carried many North Carolina writers. The legendary Gary Carden's books caught my eye and I picked up his Mason Jars in the Flood and other Stories, published in 2000 and reprinted in 2002. I found it interesting that Gary expressed a special debt to the Internet because much of this book had been read and critiqued by an online group. Many of his revisions are based on the words of hundreds of email posters.